You really have to think about what you buy when you live in 362 square feet. 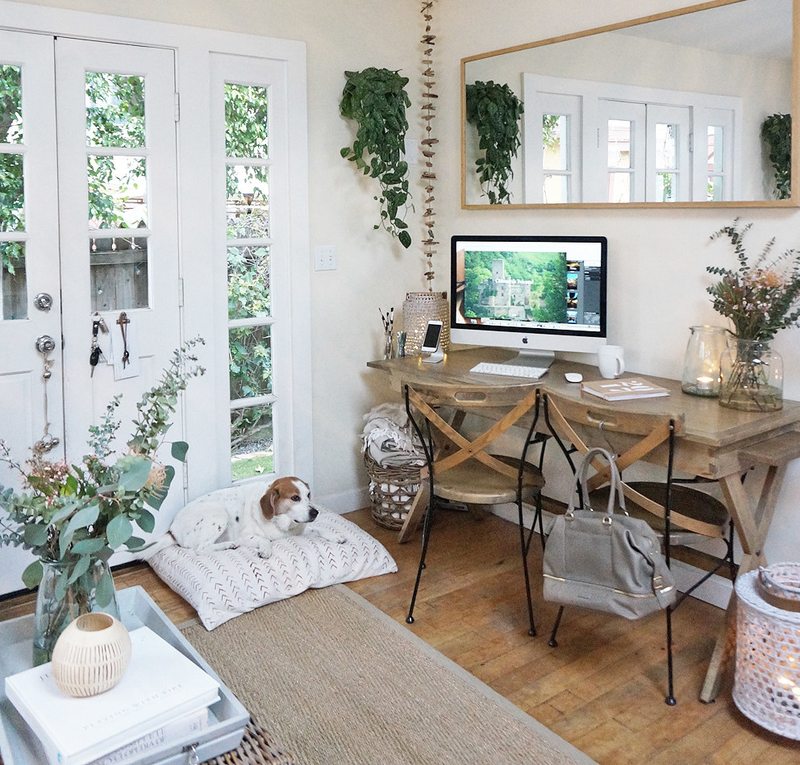 Whitney Leigh Morris is the California-based designer and blogger behind the Tiny Canal Cottage, which offers a peek into the 362-square-foot Craftsman-style home she shares with her husband, baby, and two dogs. 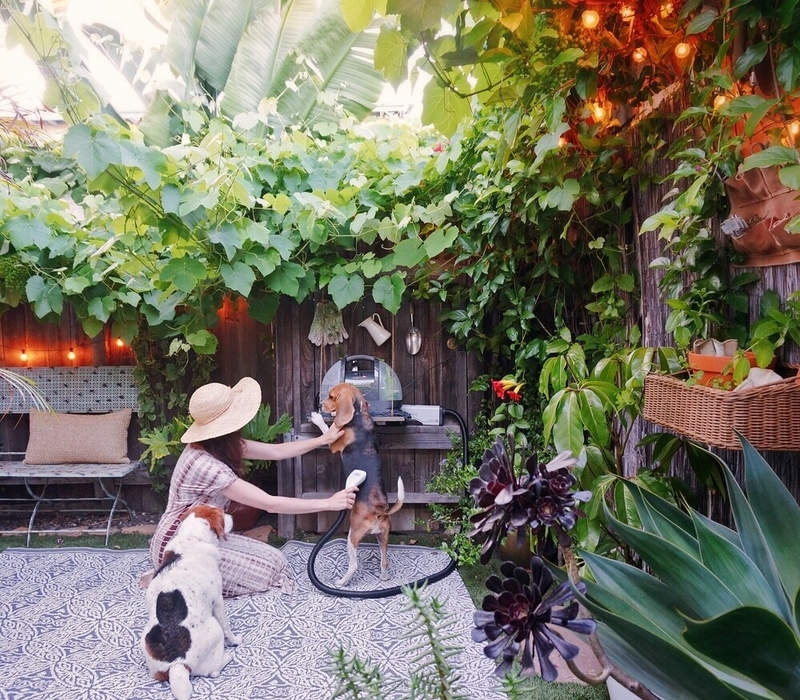 We wanted to know how she keeps a space so small — and so beautiful. Along with giving us some tips for maintaining a minimalist lifestyle, she also told us about the products she couldn't live without. 1. A few magnetic hooks to disguise your fridge with pretty and useful tools. such as these hooks — for helping it blend into the general aesthetic. Get them from Amazon for $9.29. 2. Or a magnetic spice rack to use your fridge as storage space. "Not only are we disguising the fridge, but we are also storing stuff on our fridge while making it look designed and cute," Morris said. 3. A set of hanging baskets for a vertical storage solution. "In a small space, go vertical and see if there are any items that you have that you can display as functional decor or usable art on your walls, coat racks, or shelves," Morris explained. Get these from Domino for $8.99. 4. A coffee dripper that's the size of a mug. Morris notes that when living in a small space, you only have room for the things you truly use regularly. "You don’t need a giant coffeemaker unless you love coffee and that’s what makes you happy. In that case, make room for your coffee pot," she said. "But to save money, you can just get one of those pour-over cups and then hang it with the mugs and you don’t even need to worry about making space for a coffee pot." 5. A cutting board that fits over your stove or sink to create extra counter space. This cutting board fits over both your burner and sink so you can have extra room for chopping or make some space for your appliances. 6. 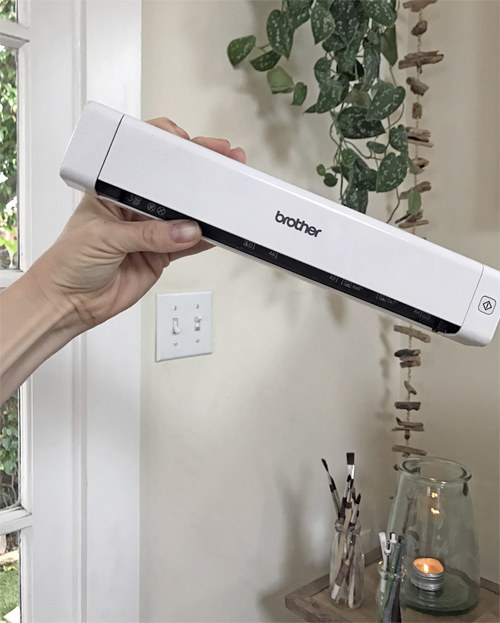 A mobile scanner that eliminates any paper clutter. "That scanner has literally helped us clear out endless boxes of files and keeps us from accumulating them," Morris said. "We don’t have a mail pile ever, we don’t have to store the paperwork for our taxes, we don’t have to keep letters that people send to us. We scan everything in and recycle the paper." She also handles necessary print jobs at FedEx instead of holding on to her clunky printer. Get it from Overstock for $97.28. 7. And a BackPack to store the scanner on the back of a Mac. Morris keeps all of gadgets out of eyesight with this backpack because she believes that "the best way to do that is by making it as homey as possible while making it less office-y but having all the tools you need to succeed at work." 8. A set of picnic baskets for an attractive storage solution. For papers that you can't throw away, Morris recommends a picnic basket, which is way more attractive than a filing cabinet or a Tupperware container in my humble opinion. Get this one from Etsy for $26.18. 9. A BarkBath to save on a trip to the groomer and prevent a mess in the tub. The BarkBath works like a carpet cleaner. It washes your pup's hair and skin with a stream of water out of a targeted nozzle. Skittish dogs might be afraid of the loud vacuum sound, but Morris recommends taking advantage of the long hose: "If you put the unit in the other room and close the door as much as possible and have the tube coming out and have someone else turn it on, it’s really not that loud at all." Get it from Amazon for $141.04. 10. A SodaStream carbonator to prevent bottle clutter. 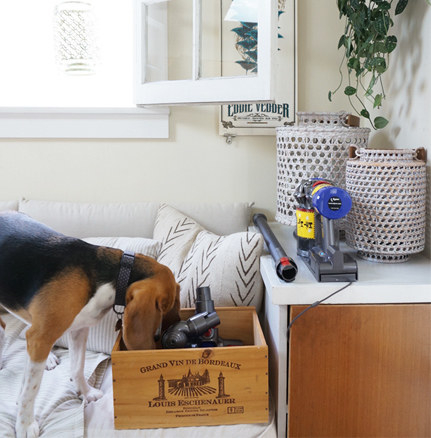 Morris looks for tools that solve multiple problems: "We’ve allocated however many inches of counter space for that SodaStream because it saves us in bottle space, it saves us in money, and it saves us in trash." Get it from Amazon for $88.99. 11. A rug that is as sturdy as it is pretty. Morris explained that rugs are a great way to define rooms within a small space without putting up walls, but a bit of research is needed to find one sturdy enough to stand up to a lot of wear and tear. "We made sure to ask the people that make or sell the rugs if they are high-traffic-friendly," Morris said. Get it from Wayfair for $43. 12. A Gathre mat to protect your floors and surfaces from baby messes. "Whether it’s for a changing table, your high-chair area, or your play area, the Gathre mat is easily cleanable," Morris explains. "It’s a leather blanket that rolls up super tiny when you don't need it." Get the high-chair mat from Land of Nod for $40 or the all-purpose mat for $70. 13. 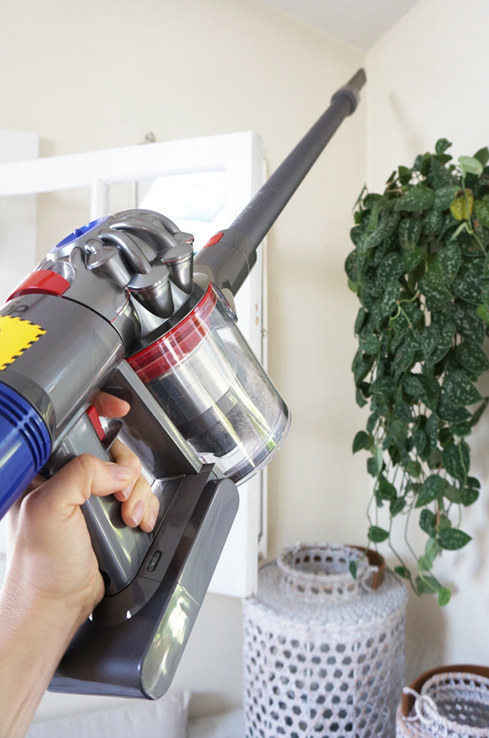 A Dyson V8 Absolute that breaks apart and fits into a shoebox. 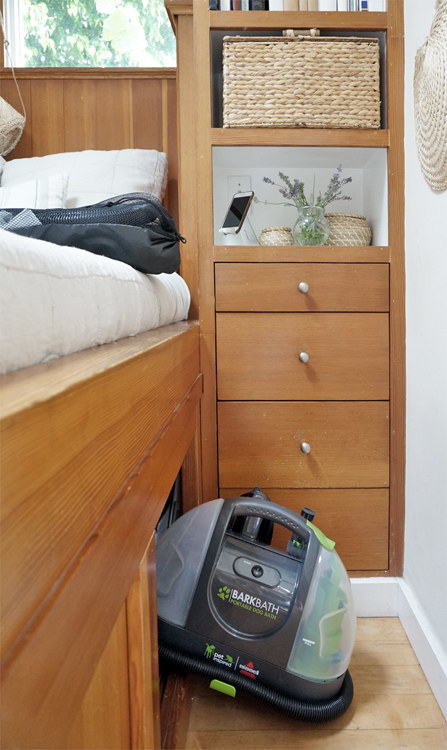 "It’s a full-size vacuum that can actually reach our ceilings," she explains. "It’s more expensive, but I think it’s worth the investment because you don’t have to worry about it [taking up space]." She keeps her vacuum in a wine crate inside of the cabinet next to her couch. Get it from Target for $599. When in doubt, give yourself 24 hours to consider if you really want or need an item before purchasing it. As Morris said, "Putting an item on hold for 24 hours can help people differentiate between passion and necessity, and impulse purchasing."